Early to bloom with 2 inch solid color and bi-color blooms of reds, oranges and yellow. Very prolific over a long season if flowers are picked frequently. 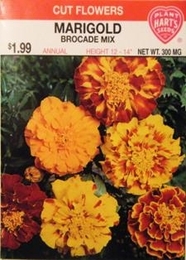 Marigolds are among the most popular and easiest to grow of all flowers. Prefer a sunny well drained location. Thinning - when plants are 2-4 inches tall thin to 8 inches apart.